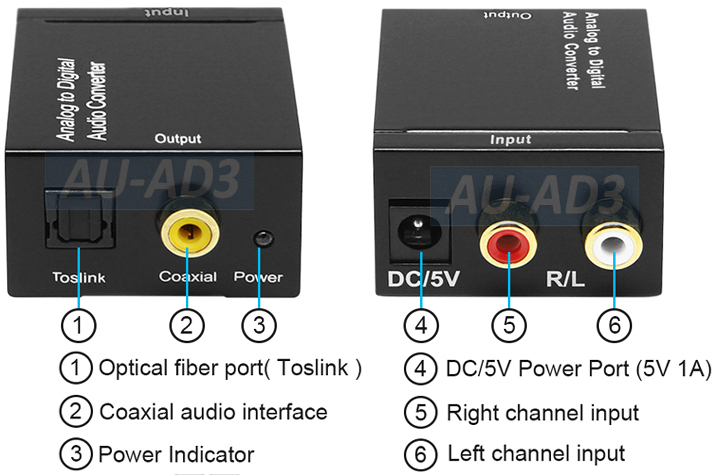 This high quality ADC (Analog to Digital Converter) is designed for converting from stereo L/R input to Coaxial S/PDIF and Toslink Optical outputs simultaneously. 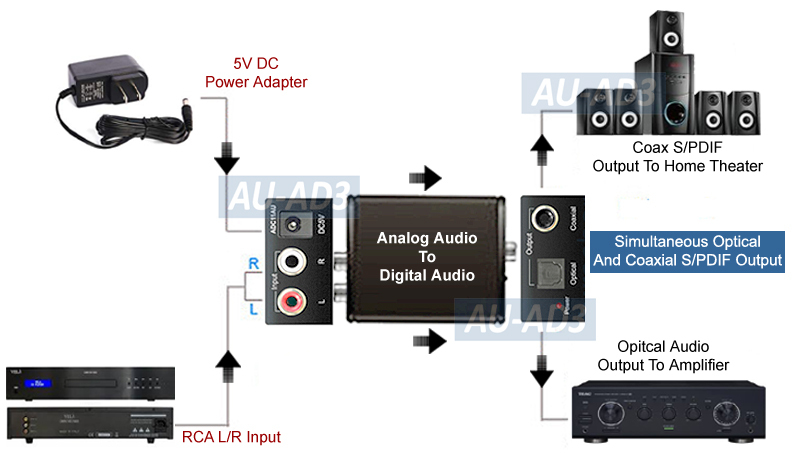 A great ADC unit for converting from analog audio devices like DVD player, iPod/MP3, computer to digital audio for audio receiver, amplifier, home theater system, speaker and other receiving devices. This unit adopts the advanced audio encoding hardware chip to transcode the audio information digitally with precision. The digital output audio signal of this A/D converter is 2-channel uncompressed LPCM (Linear Pulse Code Modulation) with sampling rate at 48 KHz, which is the standard form for digital audio on audio compact disks. This digital audio converter can be used as audio signal repeater. Both Optical Fiber and Coaxial cables connected to the outputs of this digital audio converter can run up to 16 feet while maintaining the audio signal level true to the original all the way during the signal transmission with no degradation for maximum fidelity. 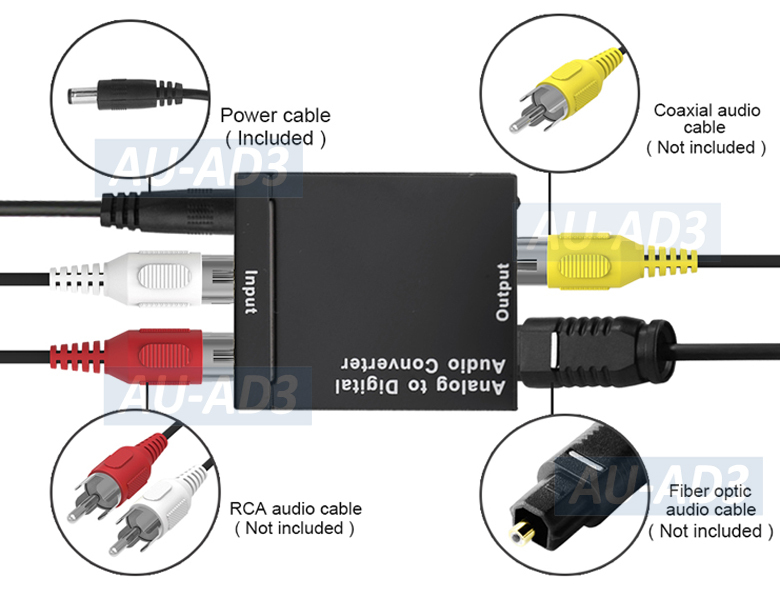 This analog to digital audio converter is very useful when audio equipments to be interfaced with do not have matching audio interconnects. Its simultaneous digital optical and digital coaxial outputs can be used at the same time for maximum installation flexibility. Also great when pre-installed audio wiring requires stereo audio to travel over one coaxial cable. It is also perfect for use with baluns that only offer digital audio pathways. This audio converter supports sampling rate at 32,44.1,48 and 96kHz with 24-bit S/PDIF bit stream. This unit adopts the advanced audio encoding hardware chip to transcode the audio information digitally with precision. The resulting digital audio output from this multi-purposed audio processor is 2-channel uncompressed LPCM type with sampling rate. High-performance stereo audio analog-to-digital (A/D) S/PDIF converter designed for professional and home audio applications. Adopts the advanced audio encoding hardware chip to transcode the audio information digitally with precision. Converts any analog stereo audio signal into both digital coaxial and digital optical audio formats. Provides simultaneous digital optical output and coaxial S/PDIF output for maximum installation flexibility. 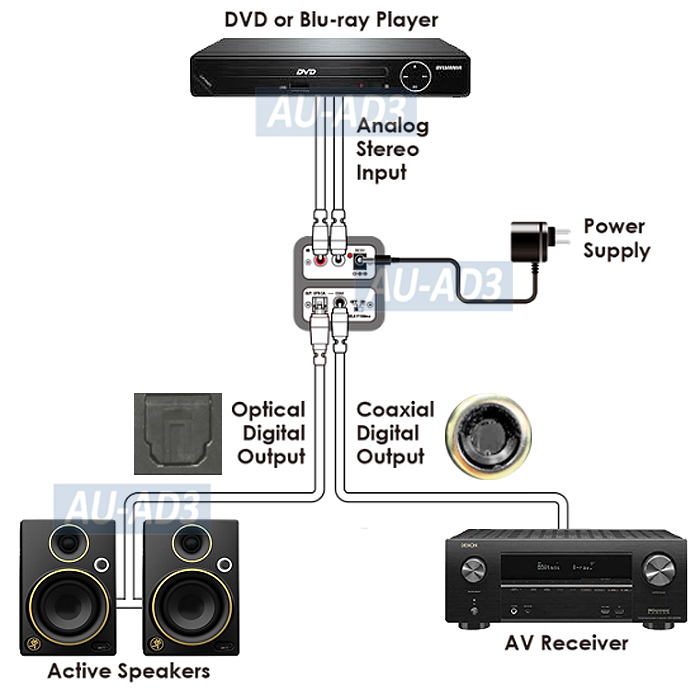 Supports uncompressed 2-channel PCM digital audio output. Supports digital audio output sampling rate at 48KHz. Supports sampling rate at 32,44.1,48 and 96kHz. 24-bit S/PDIF bit stream on left and right channels. Legacy audio sources such as a tape deck or VCR can be converted to 2.0 PCM for integration with an amplifier's digital input. Audio cables connected to the outputs of this converter can run up to 16 feet with the original sonic quality retained all the way with no degradation for maximum fidelity. Compact size with low power consumption.